Everyone who attends the NRA Annual Meetings & Exhibits is touched by the experience and that surely includes all 54,335 NRA members, family and friends who journeyed to Milwaukee, May 19-21, for the 135th reprise of NRA's signature event. From every corner of our nation they trooped to the Wisconsin city, united in purpose, drawn by the promise of a busy weekend featuring political activism and inspiring messages, educational sessions, first-class entertainment, and more than enough guns and gear to fascinate every shooter and hunter. These good folks, including numerous members of our Armed Forces and law enforcement who share the values of personal liberty and responsibility, joined together to embody the theme for the 2006 Meetings, "Freedom's 2nd Army." NRA officers opened the Annual Meetings & Exhibits on Friday afternoon, welcoming eager recruits in Freedom's 2nd Army to the Badger State. After entertainer/NRA director Ted Nugent got the energy flowing with a brief musical warm-up, NRA Executive Vice President Wayne LaPierre called attention to National Police Week and Armed Services Day by recognizing all active-duty and former police officers and military personnel in the audience. The NRA leader then paid special tribute to legendary local Police Chief Harold Breier who helped defeat Milwaukee's citywide gun ban in 1994. NRA-ILA Executive Director Chris W. Cox introduced Milwaukee County Executive Scott Walker, a member of our association, who proceeded to welcome everyone to his county. "I support the Second Amendment and the Right to Keep and Bear Arms, " Walker announced. Cox returned to the dais to hammer Wisconsin Gov. Jim Doyle's shameful record on Second Amendment rights, and then introduced pro-gun gubernatorial candidate Mark Green, who welcomed NRA members to his home state via a videotaped message from Washington, D.C., where he currently serves as a U.S. congressman. NRA President Sandy Froman shared the courageous story of Col. Jairo Paes deLira, the former Brazilian police chief who headed the "Campaign of NO" in his country, successfully defeating a gun-ban campaign backed by globalist gun-banners to strip private citizens of their rights. Country-western artist Royal Wade Kimes closed the festivities, connecting with an enthused crowd that not only liked his music, but also appreciated a celebrity who proudly identified himself as an NRA member. 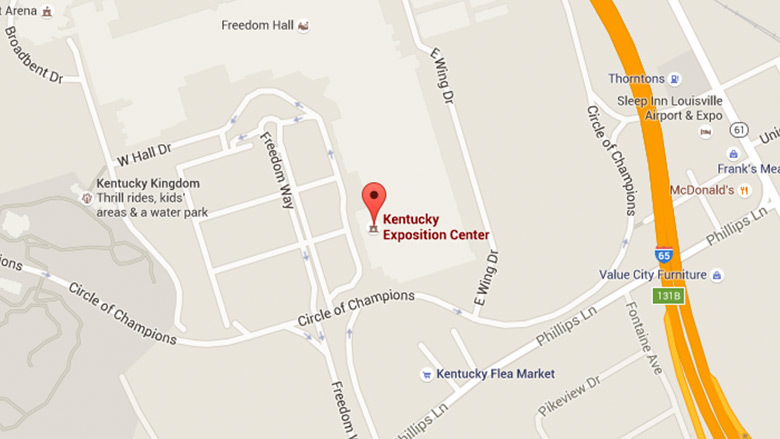 For thousands of NRA members and exhibitors, the Exhibit Hall represents the world's biggest campfire. It's a place to share ideas, talk shooting and hunting and peruse acres of firearms and related gear. It epitomizes a free America, drawing proud folks from all walks of life who share a love of country and the Second Amendment. 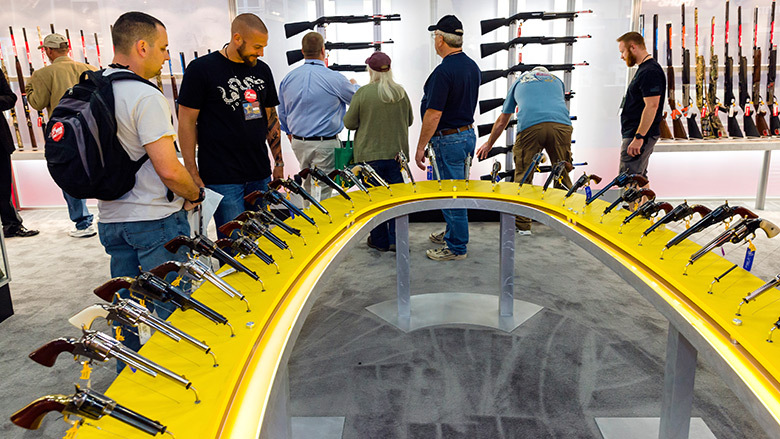 With 300+ exhibits this year, there was no shortage of patriotism, ideas and quality guns. Jerry Lutz drove three hours from his hometown of Decatur, Ill., to attend his first Annual Meetings in 34 years of NRA membership. The career school teacher is an NRA Certified Instructor and Training Counselor. When he is not shooting, Lutz works with kids and instructs about 1,000 Boy Scouts annually in gun safety. "I really liked Remington's booth because I'm interested in its youth shotguns for teaching the youngsters," said Lutz. Bob Morrison, President and CEO of Taurus, hasn't missed an Annual Meeting in 40 years. In addition to promoting Taurus' fine firearms, the Exhibit Hall offers industry professionals like Bob a rare, direct line of contact with the consumers that fuel the Second Amendment furnace. "Several organizations provide services for manufacturers, but the NRA is the one that represents gun owners. 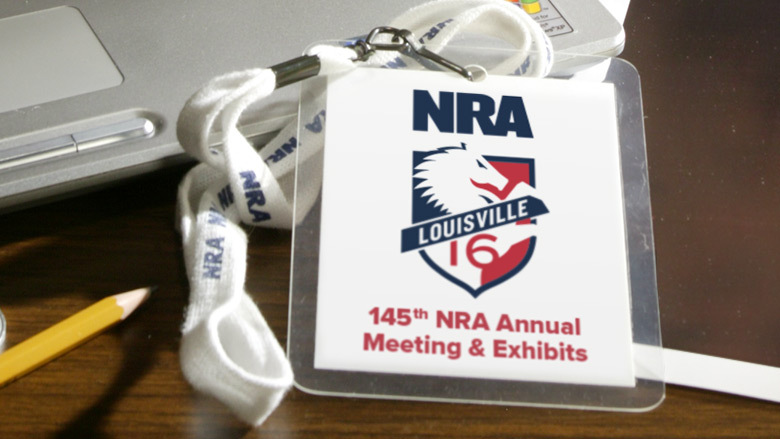 The NRA Annual Meetings & Exhibits gives us a chance to glean feedback from the final consumer—invaluable information." In short, said Morrison, "I love this show!" Smaller, yet equally innovative vendors add zest to the show. David Krien, proprietor of Coyote Jakes portable shooting benches, remarked, "This group—NRA members—is the friendliest I've ever met. And on top of meeting new friends, we sold an incredible amount of product and made many business connections. I'll be back every year." On Saturday, loyal NRA members gathered at Milwaukee's U.S. Cellular Arena for the important Annual Meeting of Members. As has been long-standing tradition, the assembly heard reports from officers, received results of the NRA Board elections and conducted parliamentary proceedings related to several proposed resolutions. In his Executive Vice President's message, Wayne LaPierre reminded the crowd that during the aftermath of Hurricane Katrina, civil authorities in New Orleans confiscated citizens' guns when they needed them most. "The NRA is asking every mayor and police chief in America to sign a pledge that says they will never forcibly disarm the law-abiding citizens of their town or city," LaPierre said. "Mayors and police chiefs have already sworn to uphold the U.S. Constitution in their oaths of office. The NRA is supporting new state and federal legislation that makes it a crime to forcibly disarm law-abiding citizens! That's how we're going to make the first time in New Orleans the last time in America." NRA President Sandy Froman painted an American portrait with broader strokes, declaring, "Firearms still hold a cherished place in our hearts. Hunting remains our proud tradition. Personal protection is our absolute right. Target shooting is still just as fun, and terrific parents still teach their kids to shoot. We still know right from wrong. We believe criminals ought to be prosecuted and punished. We love our God, our Nation and our families. We haven't changed. And at its core America hasn't changed ... freedom doesn't just happen. It requires hard work and sacrifice. It takes courage and conviction. It takes an NRA member. It takes you!" Speaking directly to local members, NRA-ILA Executive Director Chris W. Cox said, "Wisconsin is one of only two states in America ... that denies its residents any form of right-to-carry for personal protection." Then, rallying the crowd, Cox announced, "Folks, it's time to get rid of politicians who play partisan politics with your rights and with our life! So, if you want a Castle Doctrine in Wisconsin ... Dump [Gov. Jim] Doyle! If you want lawsuit pre-emption in Wisconsin ... Dump Doyle! If you want worker protection in Wisconsin ... Dump Doyle! And if you ever want a Personal Protection Act in Wisconsin ... Dump Doyle and replace him with a true friend of the Second Amendment, Mark Green!" Closing ranks with NRA's officers, Gen. Tommy Franks added a commanding presence to the inspiration and pageantry of the 135th Members Banquet. As keynote speaker, Franks delivered a speech that gripped everyone in attendance and likely will be remembered by most for the rest of their lives. Right from the start it was obvious a master communicator had claimed the room for his own. By turns he was folksy and funny, solemn and principled, confident and complimentary of yet another important force for freedom. "You folks, NRA, are patriots and intellectually gifted. You know the difference between criminals and citizens. You are the people who applaud those men and women who serve in our Armed Forces and law enforcement, who are not ashamed to say, 'One country under God.'" A variety of educational seminars and sessions challenged attendees to broaden their knowledge in key areas of interest. Most encouraging was the general's vision for America and how NRA must persevere and succeed to help ensure that vision holds true. "I thank NRA for all it's done for our country. But we're not near done. We have to secure the Constitution. "I know that because of you we have a great country. Because of NRA, we have [Americans] who have read the Constitution. Thanks to all of you for getting up every day and loving this country." As has been the custom for more than a half-century, Franks was presented a work-of-art Brooks/Hamill flintlock rifle by NRA President Sandy Froman, and one got the distinct impression that for him it would always be more than merely a finely crafted wallhanger. On that high note, the evening's entertainment ramped up with an encore from comedian T. Bubba Bechtol. The marquee act was rising country singer Miranda Lambert, a Texas-born and bred hunter and shooter from an NRA family whose powerful voice capped an evening that will go down in NRA annals as one of the best. The weekend offered fun opportunities for members to attend fundraising dinners and live auctions for The NRA Foundation. The 800 guests at the jam-packed National NRA Foundation Banquet on Thursday enjoyed trying to outbid one another on everything from guns and gear to framed wildlife art and outfitted hunts. Auction action continued on Friday with two more events. The 300 members present for the NRA Sportsmen's Luncheon & Auction also cast bids for quality sporting merchandise with proceeds going to support all types of shooting, hunting and firearm education programs. At the NRA Ladies' Luncheon & Auction, women who attended had their eyes on items from jewelry and wildlife collectibles to guns and hunting trips while enjoying a fashion show by a unique women's clothing company, Foxy Huntress. Attorneys and Second Amendment scholars from across the country came to attend the 9th annual National Firearms Law Seminar. In addition to panels on constitutional law, tort liability and ethical views from the bench, BATFE presented a special panel on licensing and regulation procedures. Members interested in bringing networking skills back to their local groups gathered for the Clubs and Associations and the NRA-ILA Grassroots workshops. Topics this year included mobilizing club members, website and publication communication and electing pro-Second Amendment candidates. The "Methods of Concealed Carry" session, always a crowd pleaser, featured noted shooter and instructor Tom Marx from Blackhawk Products. A standing-room-only audience for the "Women, Personal Protection and Power Politics" session listened attentively to personal accounts from NRA President Sandy Froman, Rep. Samantha Kerkman and Vicki McKenna, a radio talk show host and Right-To-Carry advocate, all explaining why they choose to carry. Supporting the ladies' inspiring testimonials, Greenfield, Wis., Police Chief Francis Springbob addressed Right-To-Carry legislation in the host state. A pair of special sessions made the trip especially meaningful for gun collectors and history buffs. An attentive throng filled the room Friday afternoon to learn more about "Garand: U.S. Rifle Cal. 30 M1," a discussion moderated by American Rifleman Editor-in-Chief Mark Keefe. Helping him explore the history of the American military's favorite rifle were Martin Morgan, curator of the U.S.D-Day Museum and Walter Kuleck, author The M1 Garand Complete Assembly Guide. Equally well attended was the 46th annual Gun Collectors Awards presentation, the most prestigious awards program of its kind. Moderator Wayne Anthony Ross presided and presented featured speaker Joaquin Jackson, a 27-year veteran of the Texas Rangers. Both men are NRA Directors. On Sunday morning, sportsmen were treated to "Guaranteed Whitetail Tactics," sponsored by Yamaha Outdoors. Ray Eye, one of America's best-known hunting broadcasters, and bowhunting superstar Greg Miller dispensed expert advice and deer-hunting tips garnered from lifetimes in the woods. A great crowd of 200 Second Amendment activists turned out for the "NRA and the Media—A Forum for Straight Shooters" panel discussion, moderated by NRA Director Susan Howard. Expert speakers included Vicki McKenna, a radio talk show host, journalism professor Brian Patrick and Cam Edwards, host of NRANews.com. With confiscation of legally owned firearms in the aftermath of Hurricane Katrina fully documented, NRA Executive Vice President Wayne LaPierre takes an unprecedented step at the Members' Meeting. He asks every mayor and police chief in America to sign a pledge stating they will never forcibly disarm the law-abiding citizens of their town or city. Recorded in Milwaukee, May of 2006. Folks, it's time to get rid of politicians who play partisan politics with your rights and with our life." Chris W. Cox said, ?" Wisconsin is one of only two states in America ... that denies its residents any form of right-to-carry for personal protection. Recorded in Milwaukee, May 20, 2006. The NRA President paints a portrait of America - and NRA members - with broad strokes and brilliant hues, declaring, "We haven't changed. And at its core America hasn't changed. Freedom doesn't just happen. It requires hard work and sacrifice. It takes courage and conviction. It takes an NRA member. It takes you." Recorded at the Members' Meeting in Milwaukee, May 20, 2006.